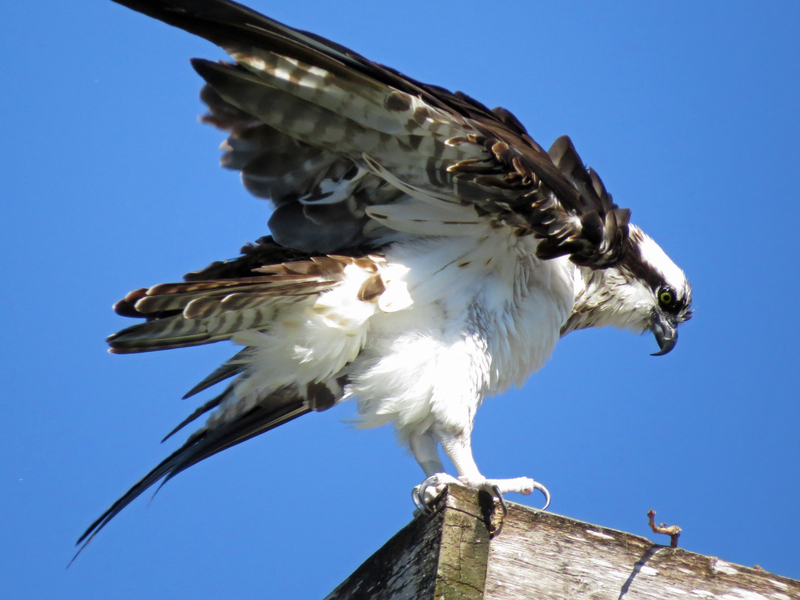 Papa Osprey Goes Fishing. And Other Serious Stuff. We are having our best weather so far this year. It’s been calling me to go outside. Finally yesterday morning I got an opportunity to spend a couple of hours on the beach and in the nature reserve. I needed that quiet time in the midst of everything going on in the outer world. It was simply beautiful. I invite you to come along. 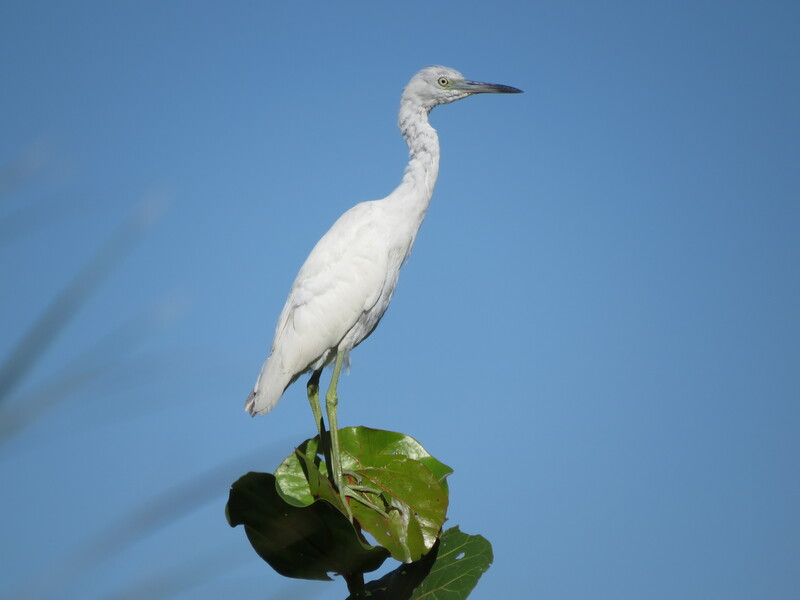 Just outside our garden, I was greeted by a Snowy Egret who was enjoying the beautiful morning at the top of a tree. 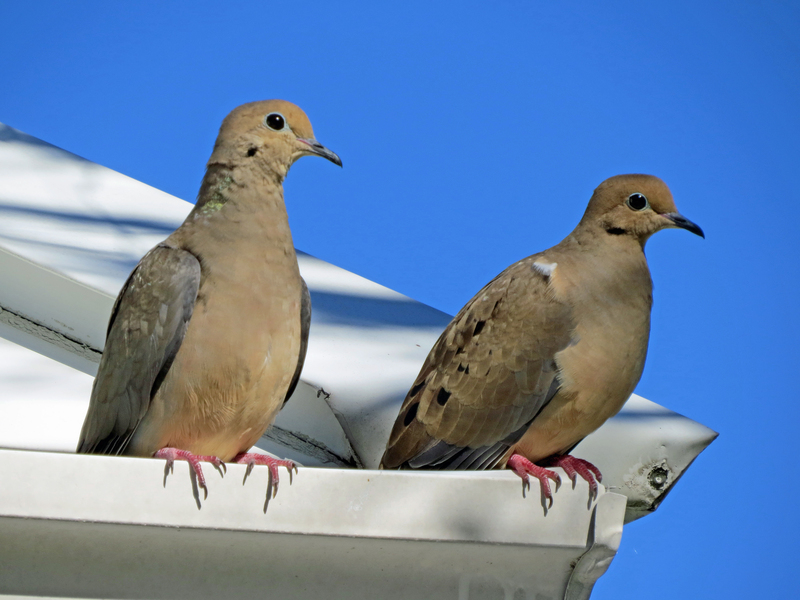 Close by, two Mourning Doves were admiring the sun. I thought they looked like a happy old couple. Content with life. No worries of the world. 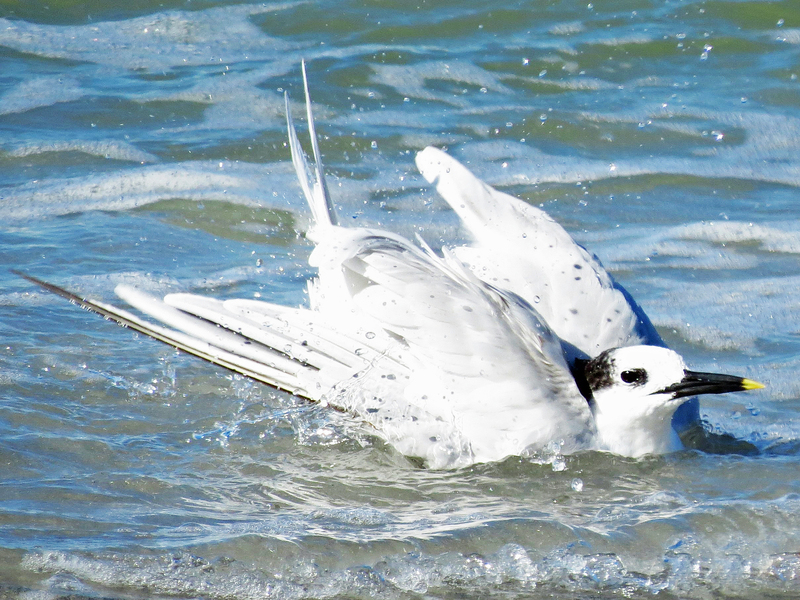 Once on the beach I was walking along the water line, watching the terns and gulls play and bath in the surf. 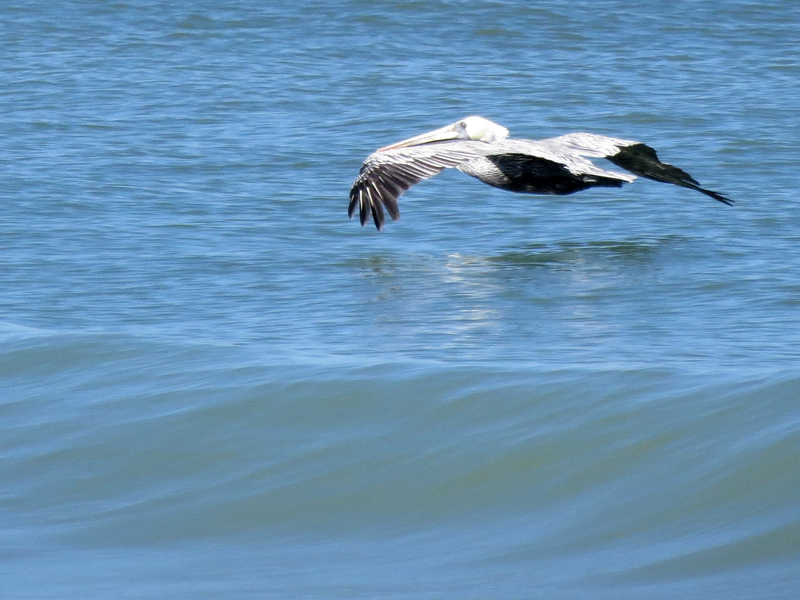 And pelicans fly back and forth in search of fish. I also found mama Royal Tern and her teenage offspring…arguing as usual. I had to smile. Some things stay the same. 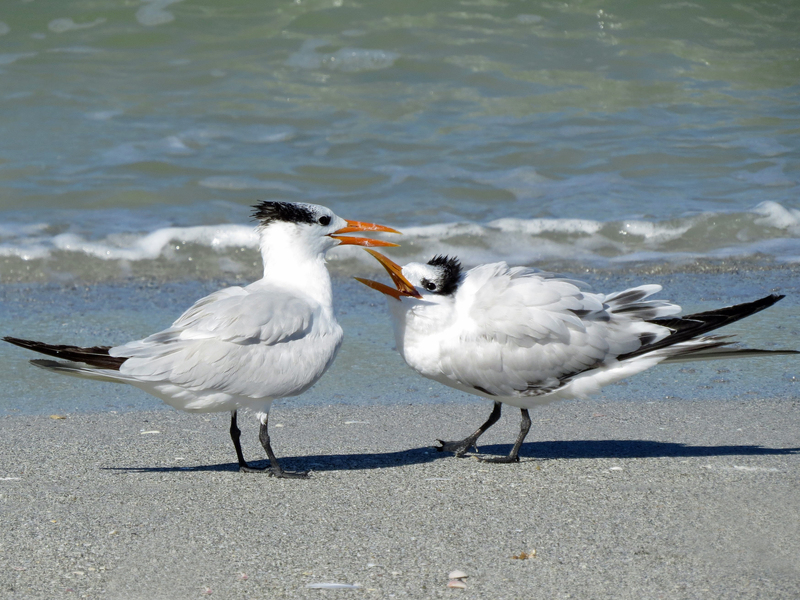 Mama and juvenile Royal Tern argue….again. 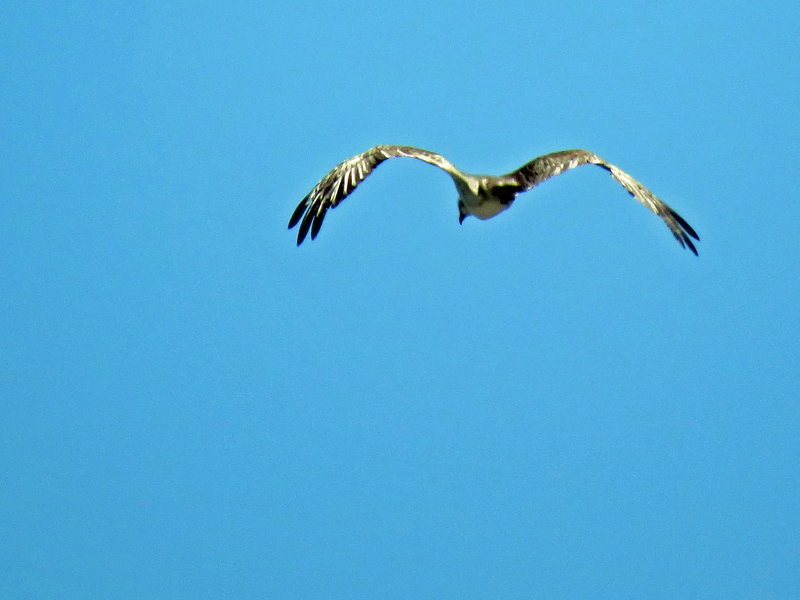 I was just about to turn towards the nature reserve when I spotted two ospreys. They were on a fishing trip. Flying high above the waves and peering down on the water. They were far out so I couldn’t see who they were, but snapped a picture of both. And guess what? 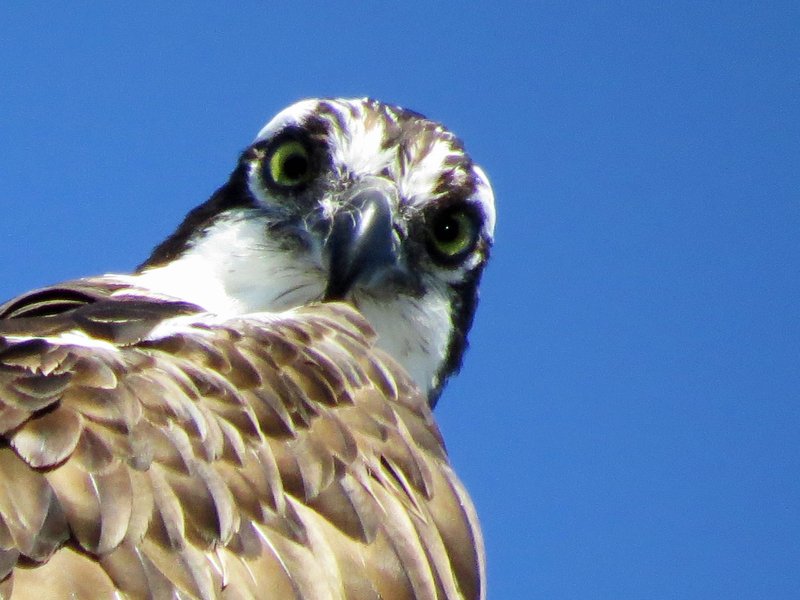 Stanley, the second osprey, fishing with P.O. 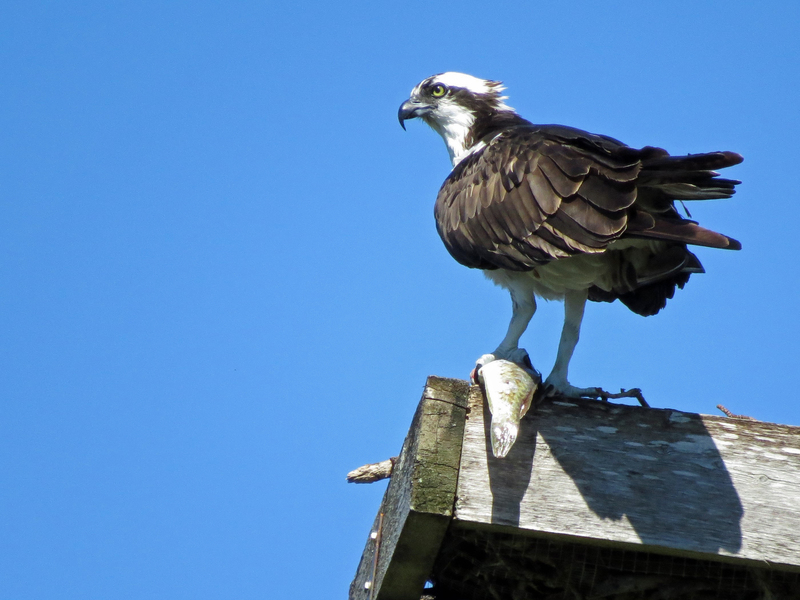 That was Papa Osprey and Stanley! They have become pals, it seems. 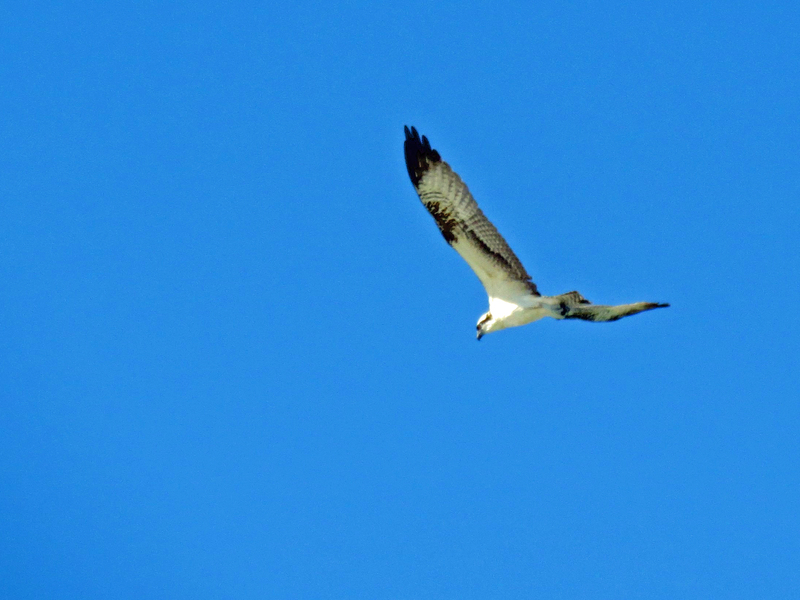 They flew further away on the ocean and I took the path to the salt marsh. 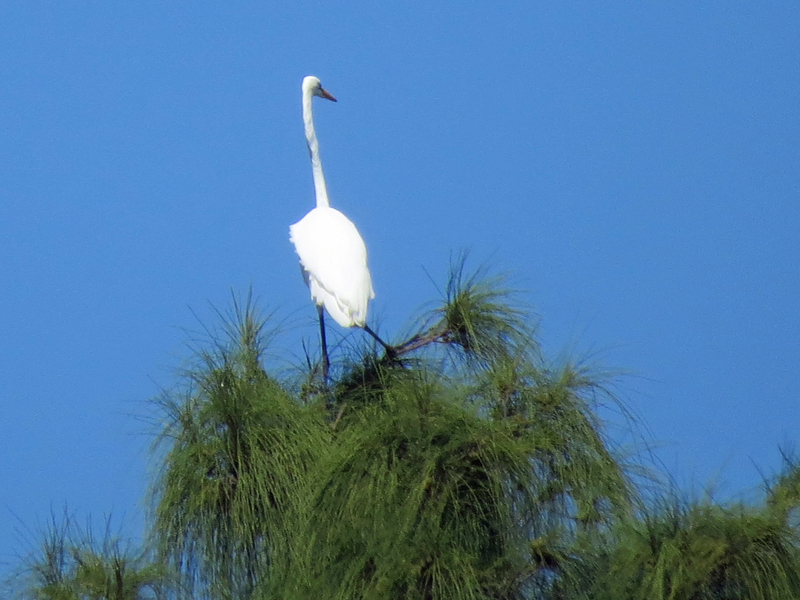 I walked on the north side of the marsh and was greeted by a Great Egret on the very top of a huge tree. I guess having an overview was trending among egrets yesterday. 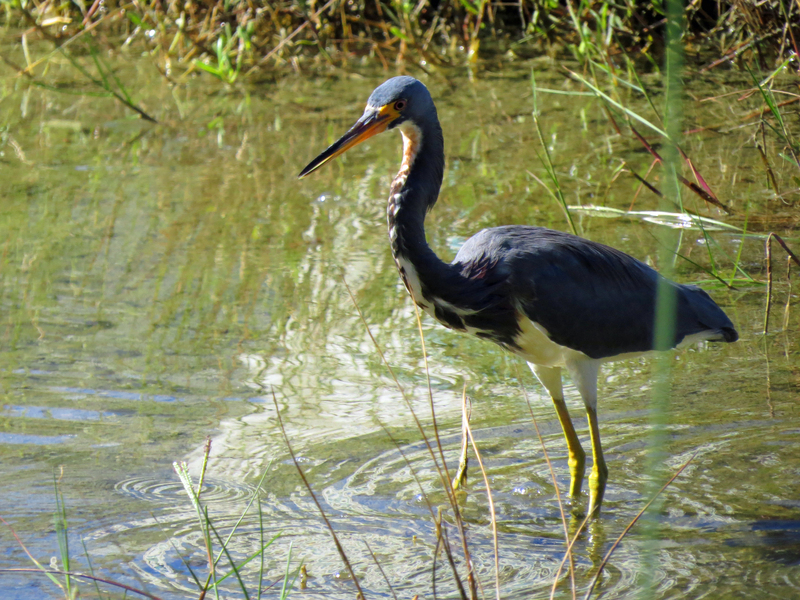 I spotted many other egrets, a juvenile Night Heron, and Tricolored Heron, among others. And my pal, the Muscovy Duck, who tends to come and greet me whenever I rest and sit on a bench. 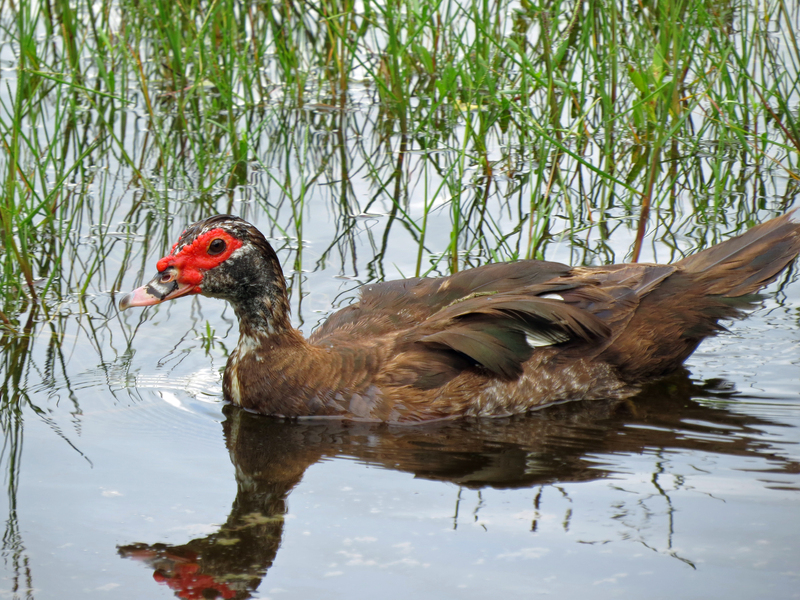 A Muscovy Duck swimming in the salt marsh…. 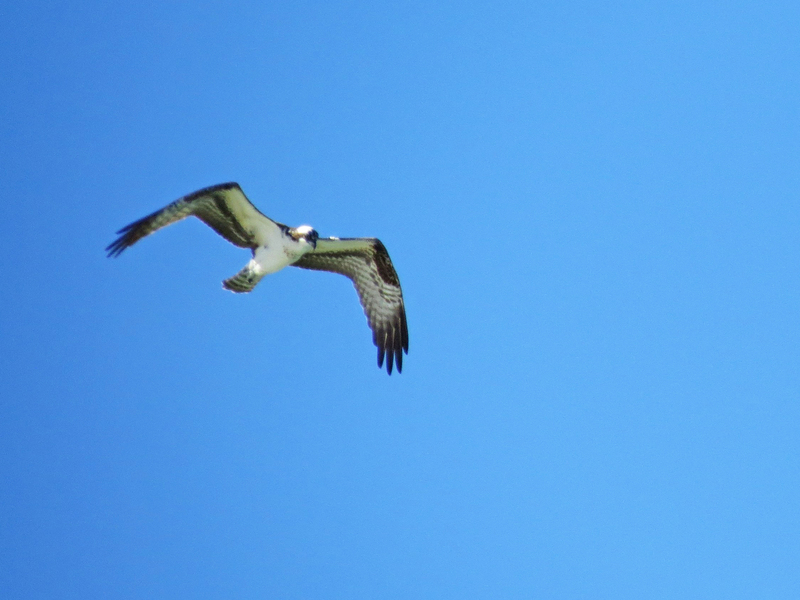 I didn’t expect to see Papa Osprey because I’d just seen him over the ocean. 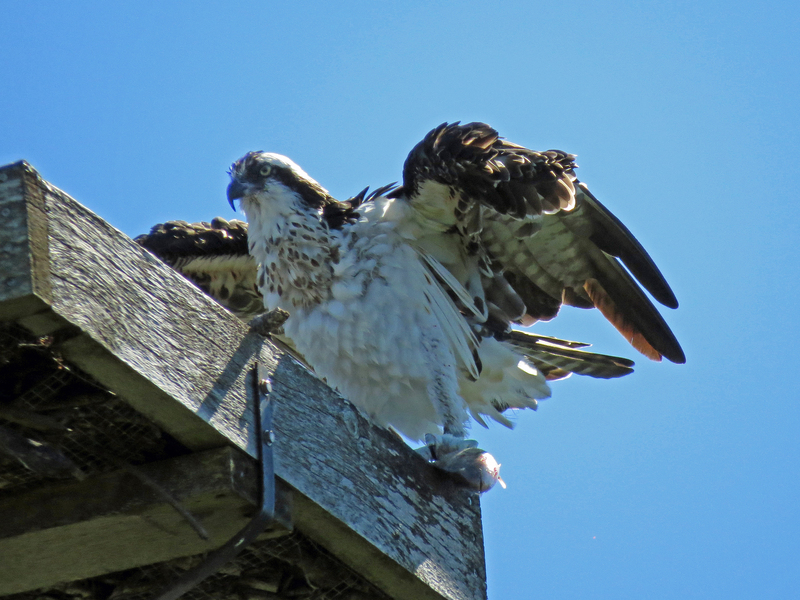 But when I approached the nest, there he was. All wet. But with no fish. I guess he was disappointed that the dive in the ocean didn’t result in fresh seafood lunch. And he must have been hungry. He turned to look at me as if saying he can’t stay. I assured him I understood, and that I’d wait for a while. Off he flew to the drive-thru fish place, aka the intra-coastal bay. I wanted to see if he’d catch a fish, so I decided to take a run around the park. I approached his nest again after about 15 minutes. And he was already back! Soaking wet and with a fish firmly in the talons of his left foot. It looked like one from the lunch menu. The second fishing trip was a success. Persistence pays off. After drying himself for a few minutes, he looked up towards the wooded end of the park and talked to someone I couldn’t see. In a friendly voice. Maybe he told his pal Stanley where he had caught the fish? After checking the airspace around him he started to eat his lunch. Soon thereafter I said my goodbyes. I may not see him until after a couple of weeks due to my upcoming travels. I’m getting to know your feathered friends. That radiation from Fukishima radiation plant in Japan is still spewing out of control into the Pacific. I am afraid all the beautiful wildlife for pictures on this post won’t be available in the so far future. Wow. You need to get on the NatGeo Bus. You are far too kind David. I’m smiling and looking at the rear lights of that bus disappearing up the mountain. I don’t know about that 🙂 I think he was really hungry. But getting a fish quickly like that is good practice for next spring when he has to fish for the whole family again! Thanks my friend! Thanks much H.J. I got a few good ones of the birds in the surf. These terns are so lively and animated, it’s fun to watch and shoot them. So glad we had this outing before your departure. I am sure he will exemplary in his behaviour. Such wonderful shots, Tiny, but the header is stunning. The force of the sea whooshes out of it. Thanks Tish. The nature is just wonderful in its many expressions. I’d like to get better in capturing it in a way that preserves this wonder. Love the clarity of your shots. So glad that your fisherman caught some breakfast. So wonderful how they’ve come to recognize you as friend, not threat. Lovely! Thanks dear Amy for your kind words! It is a privilege to be able to see so many birds so close by. Observing them soothes my soul and makes me want to share what I see. I’m so happy you liked them. May hugs to you too and have a great week. I’ll be away for a bit more than a week in Europe (off the grid)…see you when I come back. Hugs to you too! Thanks Val. Nature is fascinating and gives us so much joy! I do these walks in the nature every now and then… happy you came along! Thank you so much Maggie! I’m happy you like my bird stories. Sorry I didn’t see this comment earlier as I traveled and I’m still catching up.